TGIF. No, seriously. Thank frickin' goodness it's Friday. This week just seemed to drag by for me. I'm so happy it's the weekend! As you know.. Friday always brings along a sweet little list of my favorite things. This week, I'm going to do a blogger edition. 1. 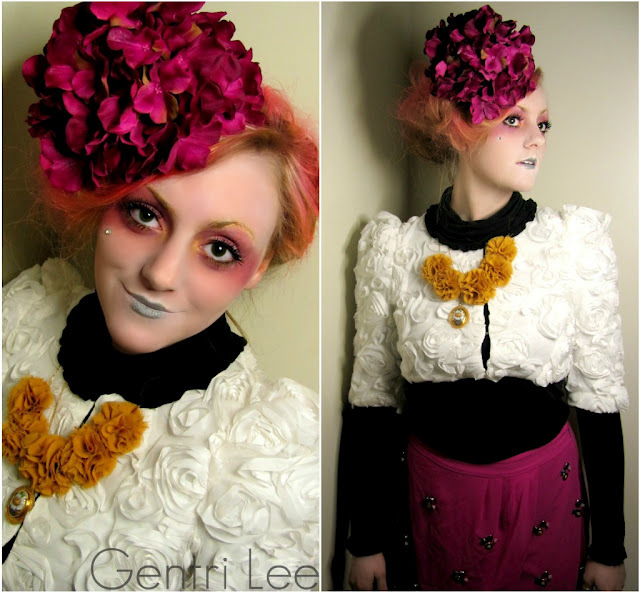 Gentri Lee's interpretation of Effie Trinket from The Hunger Games. Seriously! Gentri just started Esthetician classes, and she's already pretty amazing. Just look at the makeup she did as she interpreted Effie Trinket. So cool, right? Oh, and just to add to the awesome-ness... she recently started doing a Friday feature where she shares some of the cool stuff she's learned at school. Like... about waxing her nose and that fun stuff. 2. Anything from Erin at Living in Yellow. Guys... 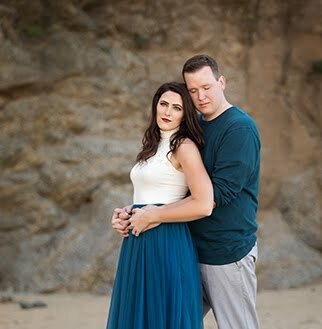 I don't know if you follow Erin, but if you don't... you probably should. I almost always leave her blog chuckling to myself. Plus, it helps that she's a fellow mac'n'cheese lover. 3. Cecilia's toucan shoes. Now... I only follow like, 2 fashion blogs (mostly because I have no hope of ever being as fashionable as those people, so I choose to just give it up), but you know I love me a good pair of shoes. shoes = my drug. So when I saw these puppies on Dearest Lou, I was smitten. 4. This post by mah friend B. at Different Paths, Same Destination. Okay, so you may have guessed that I am pretty passionate about loving the skin you're in. Hadn't guessed that? Oh, well... now you know. I'm not going to rant about it right now - I'll save you. I don't really have a picture... you just need to read it, because it's that good. So... there you go! Those are a few of my favorite things from the blogging world this week. 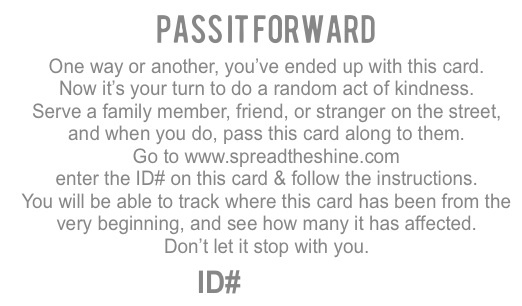 that Pass It Forward card is a great idea. simple thing to spread kindness. ps I haven't read hunger games.. Can you believe that?!! And Erin is freaking AWESOME. I love her blog. Love love love. Perfect day to use Howdy as a greeting since it's Go Texan Day, yeehawk! Those SHOES! I am drooling... and I agree that Gentri's makeup work is to die for! Aaaaaaww!! Thank you so much for including me!! :D Made my night! LOVING cecilia's shoes! i want those toucan shoes!